The Wildenbruck family is cursed by a plague of the long dead family matriarch, the Red Queen. The family legend says, centuries ago two sisters, the Red Queen and the Black Queen were bitter rivals. One day the hatred inside the Black Queen was so overwhelming she murdered her sister. Returning for her revenge “The Red Queen Kills Seven Times” every hundred years. Now the Red Queen is being seen in her red cloak at the family castle. When their grandfather dies, two sister inherit the potentially haunted castle and family curse. Will the family prophecy be fulfilled that every century two sisters in the family will fight until one meets her death like the Red Queen? A solid movie in a time and genre of film I generally despise. 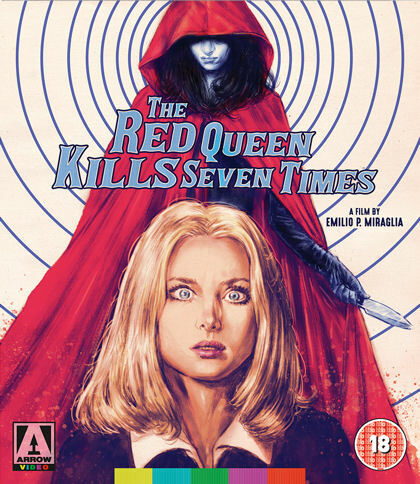 The Red Queen successfully captures the haunted, murder mystery feeling of the giallo film era. High fashion in a gothic setting, sets the tone of the film as director Emilio Miraglia creates a classic crime mystery with supernatural overtones. I enjoyed how the majority of the women look the same, to set apart the look of the Red Queen. While not my genre of film, I enjoyed it better than most. Anyone who enjoys the murder mysteries of the 70's, will probably like this even more. Brilliant restoration of the film itself has it looking must better and brighter than any previous incarnation. Included are the original Italian & English soundtracks, updated English translations, original trailers in both Italian and English, audio commentaries by film critics and many, many interviews with the actors of the film. My favorite features are the alternative opening of the movie and the archive footage the time of the film and after. The 2K restoration of, The Red Queen Kills Seven Times brings the dark half of the film back to life. No more struggling to see in the shadows on your television. WITHOUT YOUR HEAD - HORROR RADIO! We have a total of 10196 registered members. View the Member List. Without Your Head © 2005-2016. Powered by Tyler's Engine v1.31. Page generated in 0.02 seconds with 7 SQL queries.